How does a country attempt to recover after a disaster so awful that it takes the lives of thousands of loved ones and neighbours? How does a country rebuild homes, schools and businesses when it is grieving so much loss? These were some of the questions that 20 Malvern students, including myself, set out to answer in March of this year regarding the disaster of the Great East Japan Earthquake and Tsunami of March 2011. Along with our vice principal Fermer Santos and teacher Jonathan Jones, we had the privilege to experience a once in a lifetime trip to Japan. Despite all of the work required to make this initiative possible, we were ecstatic to learn about a culture so different than ours here in the Beach. Our journey was called the ‘Kizuna Project’, meaning “bonds of friendship” in Japanese. Officially, the Kizuna Project is an initiative established by the Japanese government and administered by UNESCO to promote a better understanding of Japan’s recovery efforts after the disaster of March 2011, as well as to create positive relationships between the youth of Japan and other countries. Malvern’s students acted as ambassadors of Canada, receiving orientations and participating in workshops and activities in many different regions of Japan. We prepared speeches and presentations for schools, business owners and government officials, visited a disaster affected area and took part in a homestay exchange. But it was so much more than just that official description. As a group, we spent months doing everything we could to prepare for this trip, but none of us could have imagined what we had in store. I don’t think that any of us expected to fall in love with the country or the people the way we did or for the experience to have such a lasting effect on us. We set out to learn about how the people of Japan are recovering after the natural disasters that took place, but learned so much more along the way. What really struck me was that even though there are so many differences between our cultures, at the end of the day we have more in common than I ever imagined. The Japanese may eat with chopsticks and frown upon wearing shoes indoors, but for the most part, we laugh at the same things and agree that nothing is more important than friends and family. Sometimes, all it takes is leaving all that behind for two weeks to realize and fully understand the importance of loved ones. Sadly, the Japanese were reminded of this in a much more difficult way, when the disaster of March 11 took place. Two years later, they are still recovering from these unfortunate events, despite all the work that has been done. In one fishing village we visited, the majority of the residents were still living in temporary housing. But we found a strong sense of community in the many places that we visited, and were moved to know that many of the members of these communities are still alive today thanks to the help and rescue efforts of neighbours. Each community’s team effort to fundraise and repair the destruction further inspired our group. Everywhere that we went in Japan the hospitality was outstanding. Despite the amazement that the Japanese showed over my blue eyes, I always felt at home. Everyone was so welcoming. One of my fears before the trip was that I would accidentally offend someone by doing something wrong and for the first few days I was pretty nervous. The hot chocolate vending machines and toilets that play music were a tad confusing, but everyone was more than happy to explain how things worked. I was glad to know that no one would yell at me for doing something wrong, especially because my Japanese may not have been strong enough to understand any harsh criticism. When we finally left Japan, we were all upset knowing we couldn’t pack our friends in our suitcases and take them back to Canada with us. ‘Kizuna’ was an appropriate name because the bonds that we formed were so strong. Many of us continue to talk to the friends that we made on our trip via email and Facebook, as well as look into further Japanese lessons and trips in the future. The week after we returned to Canada, a group of 24 Japanese students came to stay with us here in the Beach before continuing to Vancouver. 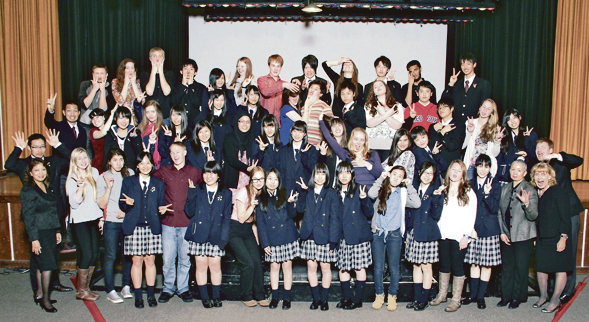 The Japanese students were able to see what Canadian home life is like and visited our local tourist spots. At Malvern, all Kizuna participants put together an assembly to educate the rest of the school about our findings throughout our journey and included a dance performance by the Japanese participants, traditional fans and all. The Malvern students were very interested in the lives of the Japanese students and had many questions to ask them. Thanks to the successful outcome of this particular exchange, the Japanese government and UNESCO hope to continue the Kizuna Project in Canada. The Malvern students want to organize a ‘Kizuna Night’ where we hope to give the Beach community a taste of Japanese culture through art, music and food. This initiative has been a life-changing experience for everyone involved and although the official part of the Kizuna Project is over, its impact on us will continue to live on for many years to come.